Google for Education Training Centre is an excellent platform for teachers' professional development. 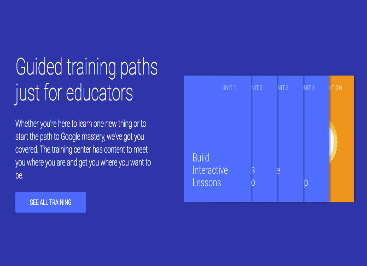 It provides a wide variety of educational resources, lesson plans, training guides, and tutorials to help educators make the best of Google tools in their instruction as well as in their professional growth. If you have some free time this summer you may want to review some of these materials and get yourself ready for the start of the new school year. Training centre provides two main courses: Fundamentals Training and Advanced Training. 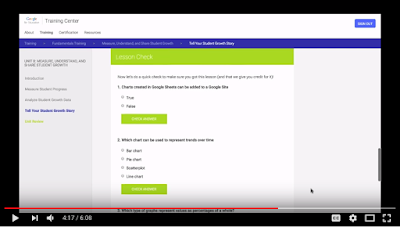 The earlier is designed for teachers who are new to Google tools and the latter is for those who are already familiar with Google tools and use it routinely in their classroom. Before you take any of these courses make sure you are signed in to your Google Apps for Education account so you can track your progress to see where you are in your training and, when you compete the models, you can print a certification credit showing your achievement.